Can any Christian be certain of Christianity’s Doctrine of Salvation? For most, the answer would be yes. They’ve confessed and professed their faith in the life, death and resurrection of Jesus the Christ. They faithfully read the scriptures (Old and New Testaments) and attend Church gatherings regularly to engage in prayer and worship. However, I intend to raise an honest question to the Christian – how certain can you be of your salvation? It is my belief that the Christian should be concerned, worried about his salvation. Why is this? I say this due to having read the Old Testament, the Hebrew Bible. For countless peoples who faithfully obeyed and put into practise what YHWH instructed them to do in the Hebrew Bible, he reneged on this doctrine of salvation by faith and works. He then allegedly instituted a new doctrine of salvation, while revealing such things as life in heaven, the punishment of hell, his multi-personhood (the Trinity) and finally the promise of the death of His Son. Christians seem to be completely oblivious to the fact that if YHWH could hide such important doctrines such as his very Triune nature, the existence of an afterlife and an entirely new doctrine of salvation, that this strongly indicates that there is no certainty he’d hold on to this current doctrine of salvation. 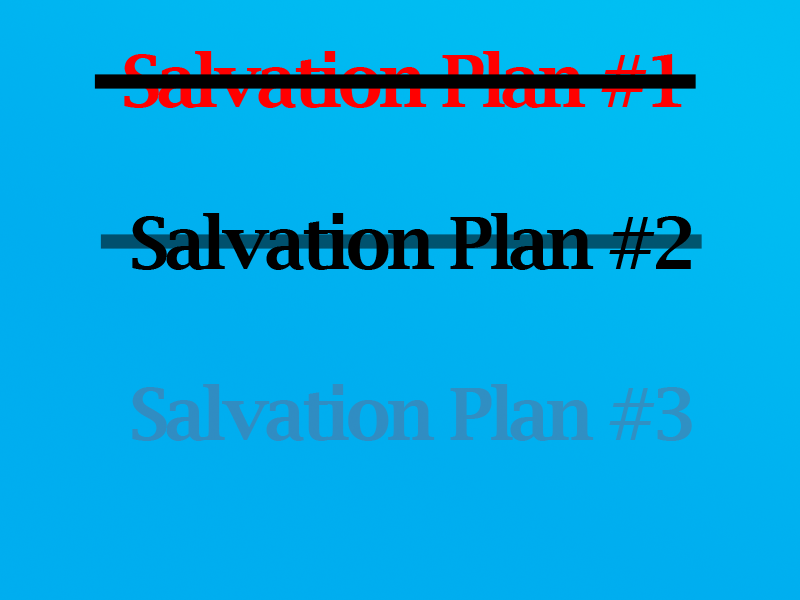 The Christian faithful need to realise, that if God can change his mind on salvation once, what is there to demonstrate he won’t do so twice? It then must be accepted, that in the future, God can very well change his doctrine of salvation again. Many will respond by saying that God has sent His son, he’s given us through the faithful predecessors his plans for us in the New Testament – all that we need to know, is with us here already. However, the Jews before Christ also claimed the same. They had one God, one scripture and they found the new Christian belief to be a heresy – the New Testament clearly indicates their opposition to this new faith. When Christians emerged unto the scene, they found themselves debating fiercely with their Jewish counterparts, indicating that such and such Messianic Prophecy was hinted by such and such verse (two of the more popular examples are Isaiah 9 and Isaiah 53). Many Christians will then use the Book of Hebrews (of the New Testament) to illustrate to the Jew how the Old Testament sayings and beliefs should have been interpreted. There is nothing to show that the God of the Christians and Jews won’t do this a third time. Just as the Jews before them, Christians too already have certainty in their eschatology and soteriology, their faith and the future is certain to them, the promise of God is what they hold to. Yet these same Christians today consider the Jews who rejected Christ to be sons of the devil and evil (John 8:44-48), enemies of the Christ (Luke 19:27), there is nothing to stop me from concluding that should the Christian God change his mind again – today’s Christians (just as the Jews before them) may very well be considered sons of the devil for rejecting God’s new plan of salvation. I mean, if Christians can look down on Jews and be perplexed as to how they can reject the new covenant, who should complain when another new covenant comes and today’s Christians reject it as a heresy (just as the Jews before them did with the Christian beliefs). The very existence of Christianity as a ‘new’ covenant, surely has to bother Christians as to what ‘other’ covenants God may have in store for the future. For if his mind can change once, who is to say it won’t change again? I see what you mean here. Anyway, it is odd for a Christian to believe he is saved 100% just because he believes. In Islam, faith and works are both very important and we as Muslims do not claim we are saved 100%. We will only know after death if we will go to heaven for what we did on earth. This is how a Christian should think too. How can they claim to know where they will be after death when they can’t even know what will happen to them tomorrow. I think its silly to be so sure of heaven as Christians are.